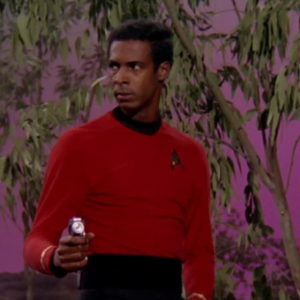 An analogy for white people: Walking while black is as deadly as being a redshirt on Star Trek. My dear fellow white science-fiction fans, let me use an analogy to try to explain one reason why people are so angry about what’s happening in Ferguson. If you only watch one episode of Star Trek (original series), the fact that a guy in a red shirt dies is tragic, but eh— that’s television. But when you watch the entire series, you realize that a disproportionately high percentage of people wearing red shirts die. It’s not that Captain Kirk has it out for people in red shirts. Heck, one of his best friends wears a red shirt. And Scotty never gets killed, so clearly not all red shirts die. And bad things happen to Kirk, too. But still— when you start paying attention, it’s pretty clear that wearing a red shirt in Star Trek is a death sentence. That’s the thing that I see a lot of white people failing to understand about the anger surrounding the Mike Brown case. It’s not just one teenager and one cop. It’s a long series. When you start looking at the statistics, you can’t ignore that a disproportionately high number of African-Americans have been killed by cops every year for decades upon decades. And this isn’t a television series that we can reboot and magically fix the problem. I’m lucky; the casting department didn’t hand me a red shirt, but I’m still living in a society that has a systemic problem. It effects everybody. When you say, “But other people are killed, too,” you’re missing the point. Wearing a red shirt hurts some of us at a disproportionately high level. And in the US, being born black is like being handed a red shirt by the casting department. Sure. You might be Uhura or Scotty. But they’re outliers and statistically, in a red shirt you’re more likely to be killed the moment you leave the ship. This is, among other things, why people are upset. Because they know that they’ve been wearing red shirts and white people keep denying that there’s a pattern. 5 Ways You Can Help Ferguson. This going to be heavily moderated. Just a quick link label correction: statement is from National Bar Association which is not the same as American Bar Association. Thanks for catching that. I’m fixing it now. The socioeconomic effects of racism on African Americans has usually been conjured in my mind to be like the “handicaps” in Vonnegut’s HARRISON BERGERON. They get to wear those handicaps all the time, and can succeed despite them, but they never get to take them off. …just like they don’t get to take off the red shirt. The statistics on how African Americans are disproportionally shot and killed by police (or by others-c.f. Trayvon) are irrefutable. There is an ingrained and reinforced perception in our society that if you are older than 11 and African American and male–you are automatically more dangerous and treated as such. (anyone remember even poor Professor Gates, arrested for breaking into his own home?). Or the 12 year old Cleveland boy recently shot? How do we fix this ingrained perception as a culture, society, and country?? This is as no way meant as a criticism of your analogy, which I find excellent. Just a note of historic interest from a Star Trek nerd — the security guard pictured above actually survives that landing party, unlike his white female companion. Trek tried to examine and think about these things. Sometimes it tripped over the preconceptions of its own era, and sometimes it was ahead of its time. The death of security guards became a lazy way for the writers to indicate that things were dangerous. A few rewrites could have solved that problem. I wish simple steps could easily fix OUR problem. I understand your point about race in general but I think you are oversimplifying a situation by not acknowledging the fact that Mr Browns actions rather than the color of his skin are what resulted in the unfortunate situation that occurred in Missouri. To say otherwise would be a huge disservice to the officers who risk their lives all across the country every day. The outcome would have been the same regardless of what color Mr. Brown was, shirt or skin. I am over-simplfying, yes, because I’m talking about only one aspect of the situation. Which is that this is not about just this shooting. It’s about the pattern of behavior. In Ferguson, in particular, that pattern extended beyond the shooting into how the protesters have been treated, how the media has been treated, and how the indictment was handled. An analysis of all of the events in Ferguson is beyond the scope of this post. But what you are doing, by trying to excuse this incident as an isolated thing, is exactly to the point I’m trying to make. Anger is a natural expression of the frustration, pain and uncertainty when justice is unequally applied. I can never claim to fully understand what an American of African ancestry experiences in this country; yet, as the child of Hispanic parents – and despite the fact that I was born in Brooklyn, New York – it was made known to me early on, and repeatedly throughout my life, that I wasn’t an American (or at least not the same class of American that others were). We are wired, as part of our survival mechanism, to quickly identify if others are threatening. We determine this, in part, from our experiences and in part from our perceptions of ‘otherness’. We slap labels on people which makes this identification – and our ability to respond quickly to danger – more efficient. As sentient and evolved beings we need to be able to step beyond this basal programming and see past the labels. This really requires getting to know ‘the other’, interacting with them, and seeing things through their eyes. Recognizing the issues and being willing to work at cleaning up these false perceptions.is not automatic. I think you mean “affects” not “effects”. I would like to see the police brutality statistic placed into context against the racial breakdown of the area being policed at that time. I would need that information before I could agree or disagree with you. Perhaps a policy where a police force must hire people in exact proportion to population density of their district is in order, although that brings its own headaches. Diversity policies are rarely successful in any arena. Thank you for pointing out the typo. I linked to two different sets of statistics which show the percentage of deaths by race in the US. This disparity has been proven by countless studies. It’s a fact, so there is no agreeing or disagreeing with me. I’m sorry…I’m not clear what that policy is supposed to do. Are you suggesting a system where only white officers can be trusted to interact with white suspects and only black officers can be trusted interact with black suspects? Because that’s what it sounds like. As for encouraging diversity in any environment– I would support that. I was speaking of changes at a local level, and statistics for the population densities of the specific area of the crime, not overall densities. And of course I’m not saying what you suggested. Noe let us keep poking the bear, poke that bear and keep the race card playing, keep the country divided, that is the way we will solve the problem. I’m approving this as a representative example of the kind of willful ignorance that keeps racism so tightly enmeshed in American culture. It is white people like you, who refuse to acknowledge that citizens of this country have profoundly different experiences based on the colour of their skin, and who continue to deny it even when confronted with verifiable statistics and data. You are what keeps the country divided. And the only race card being played is the one of white privilege that is in your hand. Thank you so much for writing clearly and making an analogy that might be understood. My Dad’s best friend was like a brother to him in every way that mattered, he was like a second dad to me growing up. When I was a kid, he came over one day to work on Dad’s car and got arrested because a helpful neighbor saw him working on the car and called the police. I went to schools that were predominantly white, lived in a neighborhood that was predominantly white. Teachers and neighbors who knew that I was getting the exact same education as everyone else in the neighborhood were surprised that I loved to read, that I was advanced placement. One day I was visiting my husband at his job, and security came over to ask him if I was bothering him. I was dressed well that day, had a Nordstrom’s shopping bag in my hand and I was with our daughter. Color is an issue in this country, and the Michael Brown case was chilling to me because my own son is over 6 feet tall and he’s gentle, sweet, considerate and is never going to be white. I’ve had to teach him his entire life to be so very polite and careful in a way that other parents will never understand. If you’re white, armed, and arguing about your rights, you’re probably a Constitutionalist and patriot. If you’re any other color, armed and arguing about your rights, you’re probably a thug. This is a problem.